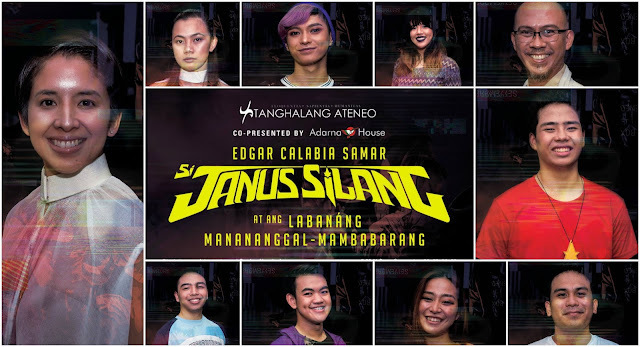 Evo & Grace: The WanderLusts: Si Janus Silang at ang Labanang Manananggal-Mambabarang - Theater Review. 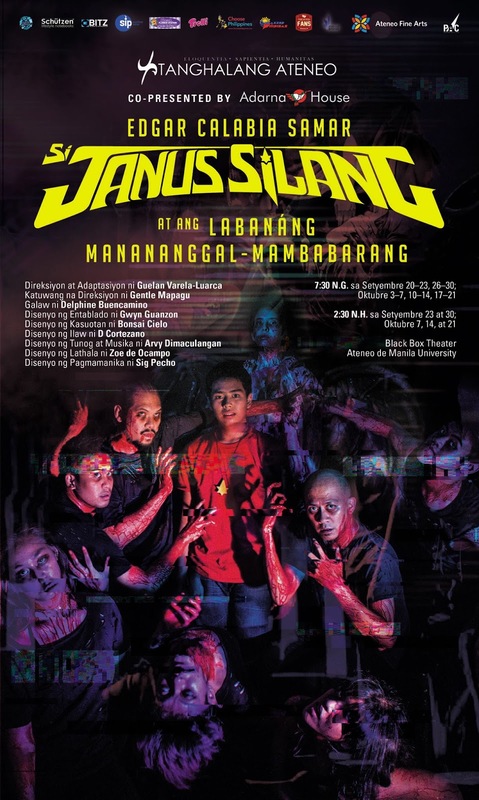 Si Janus Silang at ang Labanang Manananggal-Mambabarang - Theater Review. When I was in college, I was a part of the only theatre group in our university called Tanghalang Bayan ng Kabataan sa Baguio (TABAK-Baguio). With no means of income, the struggles of mounting a production were very evident. We would rely on costumes and props which are readily available. Sponsorship was just an option since no one would like to gamble their money on protest theatre. Campus theatre has been striving to survive. This is the dilemma shared by Guelan Varela-Luarca, director of Tanghalang Ateneo’s Si Janus Silang at ang Labanang Manananggal-Mambabarang. He told the press after their show on Saturday to spread the word about the problems that theatre groups in universities and colleges are facing. Support for campus theatre has always been agonizing. Despite the struggles, Tanghalang Ateneo opens its 39th season with the second installment of Janus Silang. Based on the multi-awarded Pinoy fantasy book series by Edgar Calabia Samar, Si Janus Silang at ang Labanang Manananggal-Mambabarang continues with our teenage protagonist’s search for the Tala to defeat the threat of Tiyanak to humanity. Janus’ journey is backed up by his mentors, brothers Mang Joey and Mang Isyo, who are “bagani” (protector of the Pusong bloodline) and know the history of the Manananggals and Mambabarangs. Together with the twins Miro and Mira, who can traverse to the other world, Kalibutan, they travel to different worlds and try to save them. If you’re not familiar with the book series, try to imagine Lord of the Rings in Filipino setting. In this fantasy-themed production, one should expect lots of stunning production design and costumes and big stage movements. Janus Silang did not fail in those aspects. In a very intimate space, TA was able to fulfil the imagination of its audience. The small space could be a disadvantage though as you can notice the very littlest mistakes. You can also get out of focus as there were performances on both sides of the room at the same time. It would have been better if it was staged on a bigger theatre so the actors can have more room for big movements. Earvin Estioco stars for the second time as Janus Silang and perfectly nails the part. Veteran actors Carlo Vergara, Renante Bustamante and Jenny Jamora join the cast of skilled young thespians of TA. The artistic team of Janus Silang is composed of Tanghalang Ateneo Artistic Director and Moderator Glenn Sevilla Mas, Guelan Varela-Luarca (Direction and Adaptation), Gentle Mapagu (Assistant Director), Delphine Buencamino (Choreography), Gwyn Guanzon (Set Design), Bonsai Cielo (Costume Design), D Cortezano (Lights Design), Arvy Dimaculangan (Sound and Music Design), Sig Pecho (Puppet Design), and Zoe de Ocampo (Graphics Design). The playdates of Si Janus Silang at ang Labanang Manananggal-Mambabarang are September 20-23, 26-30, October 3-7, 10-14, and 17-21. Performances start at 7:30PM while Saturday matinee shows start at 2:30PM. Performance venue is the Ateneo de Manila’s Black Box Theater at the university’s Fine Arts Annex Building. I love watching theaters. It feels like I am watching the movie live on the stage. I have read your reviews on this theatre and enjoyed it alot.